Voting Rights Act: Southern Republicans contain their celebration. 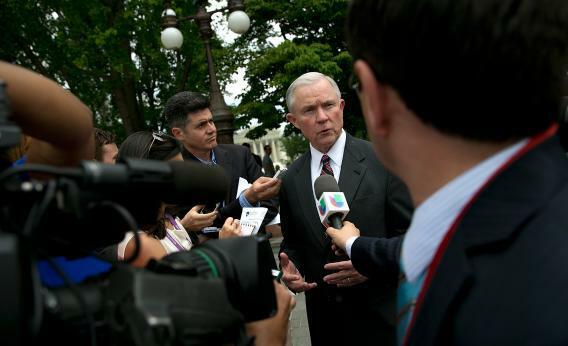 Sen. Jeff Sessions, R-Ala., speaks with reporters on June 20, 2013, outside the U.S. Capitol. He argues his home state is no more likely to deny minorities the vote than Northern states. Republicans haven’t exactly raced off the starting blocks to celebrate today’s Voting Rights Act decision. The last time the law was renewed, in 2006, every single Senate Republican and the vast majority of House Republicans voted for it. But today SCOTUS asked Congress to take another crack at regulations that would backstop states or counties if they passed laws that discriminated against the voting rights of any racial group. Republicans were not sure where to go next. They were definitely pleased that Southern states, subjected to “pre-clearance” for years, were free at last. “I’m very sensitive to make sure that everybody gets a chance to vote, but I think my state has made tremendous strides,” said South Carolina Sen. Lindsey Graham. “I feel comfortable that we can have fair elections.” But he didn’t know if he would back, or if the country would need, a new pre-clearance law. Alabama Sen. Jeff Sessions was more talkative. The decision, after all, was rooted in a dispute in his state’s own Shelby County. Roll Call’s Meredith Shiner prodded Sessions a bit, pointing out that most of the successful VRA lawsuits happened in states that had been subjected to pre-clearance.